We never tire of asparagus and eat it all year long. It is at its peak here in San Diego and our farmers markets are filled with beautiful bundles of asparagus. I have learned to bypass the thin, fragile stalks in favor of the thicker types of asparagus, since these seem more tasty and versatile in the recipes I like to make. 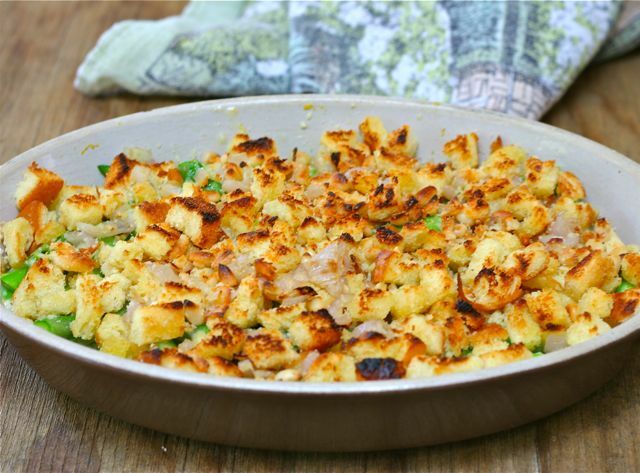 I tried this Asparagus Gratin earlier this week, pairing it with the seemingly endless leftovers from our Easter ham. Remember that old line, “The definition of eternity is two people and a ham”? Our guests had to cancel, unfortunately, so Larry and I have had our fill of ham until next Easter, I believe. Trying to be innovative and distract him from yet another ham supper, I pulled this recipe together, one I had cut out from a magazine some years ago. You could easily double this for a bigger crowd. TIP: Watch the gratin carefully as you broil it for that final minute! 1. Butter a medium-sized shallow baking dish and set aside. 2. Bring a medium-sized saucepan of water to a boil. Add asparagus and cook until just tender, about 3 minutes. 3. Drain the asparagus in a colander and add to baking dish. Cover with foil to keep warm. 4. Heat the oil and butter in a medium-sized skillet. Add the shallots and cook over medium heat until limp, about 3 minutes. Add the bread cubes and pine nuts and cook, stirring, for 5 minutes, just until the bread cubes begin to toast. 5. Remove skillet from the heat. Add salt and/or pepper and half the parmesan. Stir to combine. 7. Toss the asparagus with the mascarpone, lemon zest and remaining parmesan. Sprinkle bread cube mixture on top. 8. Broil 6 inches from the heat until topping turns golden brown, about 1 minute. Serve. How big was that ham?! And is it all gone by now? I too have a stack of recipes that I’ve clipped over the years. My problem is, there’s just so much newer stuff That I can’t remember the last time I dug through my archives. Thank you for the reminder that these are in season. I’ll have to go pick some up! Hi Kim – still more ham to go – quiche tonight, then lentil soup later this week with the bone. Whew! I really like the use of marscapone cheese in this! And of cousre those hunks of bread, great photo Liz, and thanks for posting! I think I prefer your gorgeous cake, Wendy! This looks just delicious, Liz, and love that you used mascarpone!! Next time, I think I will add more mascarpone. Thanks, Susan. This is beautiful! 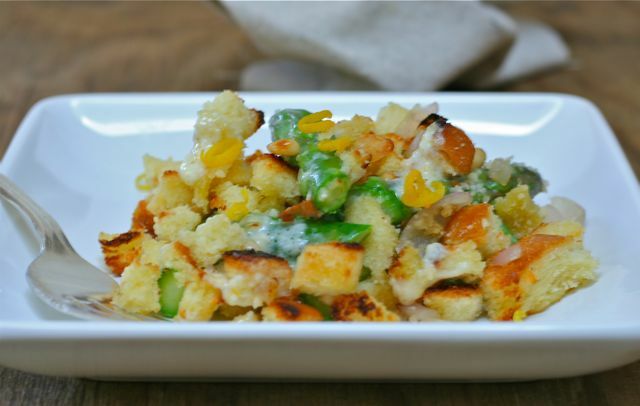 It’s almost like an asparagus bread pudding. I never tire of asparagus, either. In fact, if I weren’t packing right now, I would run to the store to get the ingredients to make this. Great recipe Liz! I love asparagus but usually just have them as they are. You have inspired me to do something different with them! I love the use of lemon zest and mascarpone! Thanks, Jayne – next time I will use a little more of the mascarpone. Asparagus and gratin….two of my favorite words. How come I never thought to use them together in a recipe like you have, Liz? This sounds perfect, and IS a recipe I will make as soon as our local spears make an appearance. Thanks for stopping by, Nina, and looking forward to visiting your site. Liz I love asparagus, too. It’s just soooo tasty and you’re right, it’s in full swing right now in San Diego. So are everyone’s lemon trees as I walk and run aroudn the neighborhood, every other tree seems to be FULL of lemons! Hi, Averie – someone swiped all my ripe Meyer lemons, believe it or not!